"Hydrosila" at the exhibition "Construction Equipment and Technologies - 2015"
The group of companies "Hydrosila" once again took part in the international specialized exhibition "Construction Equipment and Technologies - 2015" (CTT'2015) - the largest exhibition in Russia and the CIS, which brings together leading representatives of the industry. The company "Hydrosila" exhibited the whole range of manufactured products - gear pumps and motors, axial piston machines for open and closed loop, valves, hydraulic cylinders, high-pressure hoses. At the booth of the company, along with the already known products were presented new developments - axial piston pumps for open loop series C and BF20, which are used in modern road-building equipment. The exposition of components for machinery, truck lineup which includes gear pumps Series "T" with a capacity ranging from 34 to 100 cc in the cast iron version, the series valves and telescopic cylinders MR100T added axial piston pump for open hydraulic series BF20T, standardized according to ISO . CTT exhibition includes the entire range of construction equipment, including equipment for road construction and lifting equipment, cranes, drilling and mining complexes, Equipment for concrete works, earth moving equipment, trucks and accessories. 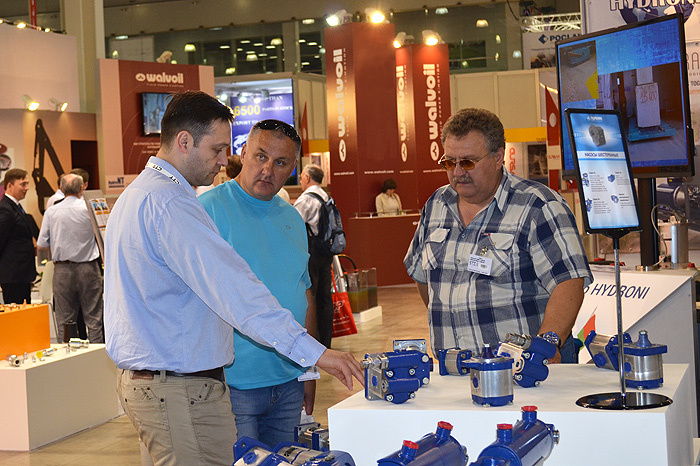 The exhibition CTT'2015 was held from 2 to 6 June in Moscow on an area of ​​over 90,000 m², was participated about 700 exhibitors - manufacturers and suppliers of machinery, equipment and components for the construction of Russia and 30 countries of the world. The exhibition was visited by over 27 000 specialists from the CIS and foreign countries.